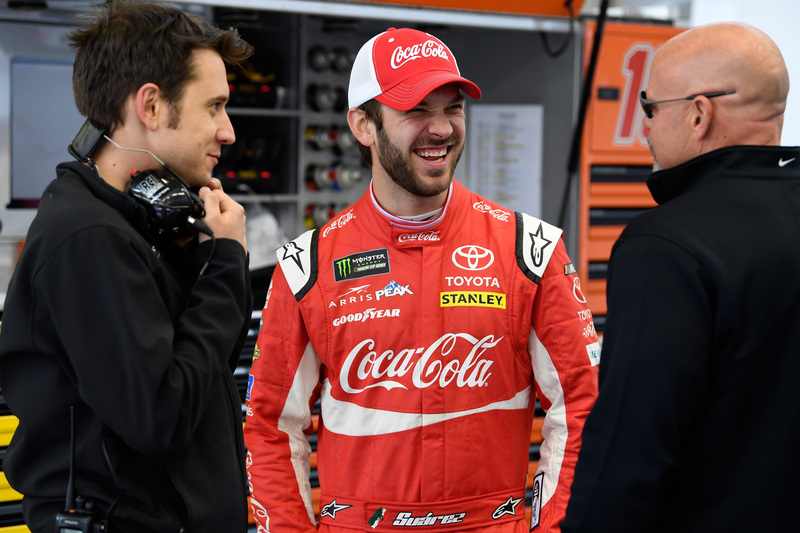 The series of 12 Questions interviews continues this week with Daniel Suarez of Joe Gibbs Racing. Suarez must win at Indianapolis on Sunday in order to earn a playoff bid for this season. These interviews are recorded as a podcast but are also transcribed for those who prefer to read. First of all, I don’t have dreams very often for whatever reason. When I’m sleeping, I’m sleeping. But (it happens) when I’m thinking too much about something — like Pocono (when he had a shot to win), for example. After Pocono, I spent days thinking about what I could have done different on that restart, and one of those nights I was dreaming about it. So for whatever reason when you start thinking a lot about something, you just happen to dream something related. I think it does. At least it does for me. I feel like as a driver, we race so often, so there’s always a comeback. My mom makes fun of me that I don’t remember a lot of things she says to me, but when it comes to racing, I remember exactly everything. Like what the car was doing or who hit me or who was too aggressive toward me. So eventually, it turns around. We always remember that. I feel like it’s always good if you did something wrong to apologize and move on. That’s the way I like to do things. It shows respect. But there’s always a line — sometimes the apology is not enough. So you still have that payback in the future. For me, the biggest compliment I’ve had is I have a good personality. That’s what I like to hear, that I have a good personality and I’m smiling and stuff like that. Because at the end of the day, that’s not related to racing — that’s something on the side of it. You know, it would be awesome to have a race car driver like Fernando Alonso or somebody on that level so they can get involved with this sport. I’ve had some friends who have come to NASCAR (and raced), like Nelson Piquet — he’s been racing everything and he knows how difficult stock car racing is. So it would be awesome to have Fernando. He’s a great guy and he’s very competitive. I wouldn’t be surprised if someday someone brings him to the racetrack and he gets that itch to try it out. No, man. (Laughs) I love chicken too much. I think I had chicken like how many times yesterday? Two times? No, that’s wrong — three times! And my sushi. Yeah, I think that’s enough to qualify well and still be close to Pit Stall 1. 6. It’s time for the Random Race Challenge. I’ve picked a random race from your career and you have to tell me where you finished. This is the NASCAR Mexico Series — the 2012 race at Aguascalientes. Do you happen to remember that one at all? Let me think. I was always fast at Aguascalientes. Maybe second or third? You finished second. You started on the pole, led 44 laps and Ruben Rovelo won the race. I remember part of it. I was leading the race in the last restart and I missed a shift and I stacked up the whole line. He wasn’t even on the front row. I had an agreement with second place that I was going to restart on the outside and he was going to let me in. And the guy who was on the inside, he just held to the agreement too long — because I missed a shift and he was waiting for me! We passed the start/finish line and Ruben made it three-wide. I went to third, and then I passed second place and at the checkered I was right on the bumper (of the winner). Maybe Eminem. I don’t follow rap a lot, but I think he’s funny. Punchable? Like to go hit them? OK, LeBron is the crew chief. Tom Hanks can be the motorhome driver. I personally think the spotter is extremely important, but if it’s an easy race, you can do without it. So we’ll put Taylor there. Oh man. You ask your PR guy maybe 30 minutes before. For some reason, all the PR guys know as a driver, every time after driver intros, you’re looking for a bathroom. Because you have to do it. It seems to me every time I ask, “Hey, Tyler (Overstreet) — where is the nearest bathroom?” He knows it. But most of the time, we have to wait a little bit because there’s a line of drivers. Everyone is there. I don’t think they would have to pay me anything, man. I would love to do it. I’d just have to train for it. If you can guarantee me I won’t get hurt training for it, I would do it. After seeing you at the Winter Olympic training last year and your workout videos, I feel like you’d be able to do it. I honestly think I’d be able to get it done, but it takes training. More than being strong, it takes technique. And to develop that technique, you make mistakes. I can’t afford to get hurt. So that’s why I say if you can guarantee me I wouldn’t get hurt, I would do it. That would be a lot of fun. Plus, Carl Edwards is a friend and a great driver. Obviously, nobody is able to do what he did after the race because after the race, you are tired. So to do that after a race, that means you are in pretty good shape. So he was pretty damn strong. 12. Each week, I ask a driver to give me a question for the next interview. Last week’s was with Brad Sweet. His question for you was: Have you ever driven much on dirt, and if you did want to race on dirt, what car and what track would you want to race? That’s a good question. In Mexico, we don’t have one racetrack that’s a dirt oval. All the dirt we have is for motorcycles. But in the west (part) of Mexico, in Chihuahua, they do have some dirt racing — but it’s with old cars. It’s more for fun, not professional racing. That’s the only kind of racing I’ve heard of with cars on dirt in Mexico. So my background is just so different, that’s not something I have done. I’ve never been on dirt in my life. The first time I got invited to a dirt race, five or six years ago, I showed up with a white shirt — you could tell I was 100 percent a rookie. I wish one day I could try it — maybe a sprint car, because those things are fast. I saw your video after you did a two-seater and I was impressed you were impacted like that. So maybe a sprint car would be a lot of fun. As for a racetrack? Maybe Eldora would be good. Do you have a question I might be able to ask for the next interview? It will be with an IndyCar. Yeah, actually. When I grew up with my family, I was watching more IndyCar than NASCAR. That’s because in my hometown (Monterrey, Mexico), IndyCar — actually Champ Car — used to go there every year. So I used to go there when I was 13 or 14 years old with my father and watch. That was a lot of fun to see the noise and the power of those cars. I enjoyed that a lot. So my question would be: How much do they enjoy road-course racing versus ovals? And one day, would they be interested to try NASCAR either on an oval or road course?